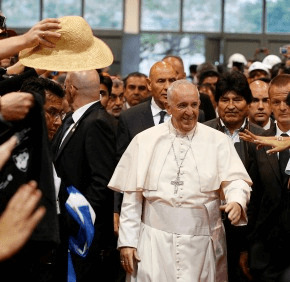 The activists — including labor union representatives and people who organize cooperatives for the poor who make a meager living recycling trash or farming small plots or fishing — combat “many forms of exclusion and injustice,” the pope said. “And behind all this pain, death and destruction there is the stench of what Basil of Caesarea called ‘the dung of the devil’ — an unfettered pursuit of money,” the pope said. At the same time, Pope Francis asked the meeting participants to recognize that many Catholics — priests, nuns and laity — willingly gave their lives in service to the continent’s peoples.